The 1998 Canadian Grand Prix was the seventh round of the 1998 season. The race was won by Michael Schumacher for Ferrari with Giancarlo Fisichella and Eddie Irvine finishing alongside him on the podium. The race was notable for neither McLaren's finished the grand prix. Heading into Canada, Goodyear once again had received criticism from Ferrari's Michael Schumacher, Schumacher attibuting Ferrari's performance deficit to McLaren as being 75% the inferiority of the Goodyear tyres in comparison to the Bridgestone runners. The Head of Goodyear's Italian branch Antonio Corso stated in response to Schumacher's claim that Luca Di Montezemelo, Jean Todt and Eddie Irvine are people you can deal with. But with Schumacher it is different as he is considered only slightly lower than God". Goodyear, would however being a brand new tyre for its teams to Montreal in order to compete with the Bridgestone's. The Canadian Grand Prix was also the home race of reigning world champion Jacques Villeneuve, Villeneuve who had suffered a torrid season was aiming "to put one foot back on the podium" in Montreal, with his and Williams's main goal being to get ahead of the Ferrari's in the race. Ralf Schumacher in the Jordan was the first car out setting a 1:19.682. Johnny Herbert then ruined his lap, running wide into the first corner. David Coulthard then easily bettered that time with a1:18.838. On Mika Häkkinen's first lap he was notably held up by championship rival Michael Schumacher being forced to abort the lap. Schumacher then went second fastest with a 1:18.952. Schumacher's second lap saw him go faster than Coulthard with a 1:18.621. Giancarlo Fisichella then put in a strong lap to go third fastest in the session. Home talent Jacques Villeneuve was running sixth fastest, behind Johnny Herbert and Ralf Schumacher. However the second Sauber of Jean Alesi would further demote Villeneuve as he moved into fifth place. Eddie Irvine then set his first lap moving into fourth place behind Schumacher, Coulthard and Fisichella. Villeneuve then ruined his next lap to go faster when he overbraked himself before the hairpin. Michael Schumacher remained fastest by the mid-point of the session, Coulthard seemingly unable to respond on his third lap. The next lap, Coulthard pulled in a strong lap to take provisional pole with a 1:18.344. However when Häkkinen set his first competitive lap he took provisional pole position with a 1:18.282. Rubens Barrichello then suffered an engine failure going into the first corner, ending his session whilst sitting in twelfth place. Jacques Villeneuve then improved his time to move into sixth position. Ralf Schumacher who was running well for Jordan improved his time but failed to set a time to overtake Fisichella's Benetton in fourth. In the final few minutes, both Ralf Schumacher and Jacques Villeneuve had completely their allocated 12 laps, meaning they would not improve their times. Coulthard then set the fastest time with a 1:18.213. Häkkinen failed to respond being forced to abort his flying lap. This meant Coulthard took pole ahead of Häkkinen, Michael Schumacher, Fisichella, Ralf Schumacher and Villeneuve. As the cars left the grid, Michael Schumacher managed to overtake Häkkinen around the outside of the corner, moving into second behind Coulthard. However it was all to no avail, Ralf Schumacher stalled on the grid and to further the woes there was a major pile-up going into the first corner. Alexander Wurz was squeezed wide going onto the grass on the inside of the first corner, unable to break his car careered into the oncoming cars of Jarno Trulli, Jean Alesi and Johnny Herbert. Wurz flipped over these cars and into the gravel trap. Luckily the race was stopped allowing Wurz, Alesi and Trulli to run back to the pits to get into their spare cars. Johnny Herbert in the second Sauber was forced to concede the spare car to Alesi. Luckily for Herbert, his car was returned to the pits and was able to be sufficiently repaired to be able to take the re-start, starting from the pit-lane. 40 minutes later the race prepared to take its second start. In contrast to the first start Michael Schumacher made a poor getaway, dropping to fourth behind Giancarlo Fisichella. However as the cars entered the first corner, Häkkinen suddenly suffered a gearbox failure bringing his car to a dead halt in the middle of the track, causing the cars one again to get out of shape into the first corner. Ralf Schumacher spun round at the first corner, causing mayhem into turn two. Jean Alesi ran wide into turn 2, before Jarno Trulli plowed into the back of him, launching on top of Alesi's car. Entering the first corner Häkkinen, Ralf Schumacher, Trulli and Alesi were elliminated from the grand prix. At the front Michael Schumacher was able to regain second, going around the outside of Fisichella at the hairpin. After the first lap, the stewards brought out the safety car instead of restarting the race. The carnage of the first lap had an effect on Eddie Irvine's Ferrari, Irvine was left running at the back with a puncture, being forced to stop at the end of the first lap. Toranosuke Takagi also retired when his car failed to leave the grid. As the safety car lapped round it was Coulthard leading Schumacher, Fisichella, Villeneuve, Frentzen, Barrichello, Hill, Magnussen, Diniz and Rosset. At the end of the fifth lap, the safety car came into the pits, resuming the race. The end of lap six saw Barrichello overtake Villeneuve for fifth position. Coulthard and Schumacher began sprinting away from Fisichella in third, Schumacher attempted to overtake into the penultimate corner, however Coulthard defended the move. Barrichello however was able to dispose of the second Williams of Heinz-Harald Frentzen to move into fourth. However as Barrichello began to chase down Fisichella, he ran wide at the hairpin and into the gravel. This meant he would drop down to seventh behind the two Williams and Damon Hill's Jordan. Lap 11 saw Pedro Diniz spin off the circuit whilst chasing down Jan Magnussen in eighth. Diniz rejoined but was some way down the field. As Diniz rejoined the track, his car's radiator ducts were filled with grass and dirt from when he went off. For the next lap Diniz was exerting dirt and grass throughout various places of the circuit. Diniz struggled around back to the pits, to get the dirt cleared out of his car. The safety car then came out to clear out the dirt that Diniz had left throughout the circuit. When the cars resumed racing on lap 17, Diniz was caught in the middle of the leaders following his pit-stop. This allowed Coulthard and Schumacher to pull away as the cars behind struggled to get around the lapped Diniz. However the following lap, Coulthard slowed down suddenly with a throttle failure crippling his car as the field overtook him before he peeled into the pits and into retirement. Causing the first double-McLaren retirement of the season. The same lap saw Mika Salo in the second Arrows plough into the wall and into retirement. A few corners later, Johnny Herbert in the Sauber spun off the circuit and into retirement. The incidents on this lap meant that the safety car returned to the track. Lap 20 saw Michael Schumacher conduct his first pit-stop whilst under the safety car, Schumacher exited the pits just ahead of Heinz-Harald Frentzen, however Schumacher refusing to concede the position to Frentzen, shot across the circuit forcing Frentzen wide into the first corner. The Williams driver went wide and spun into the gravel. This meant as the safety car came into the pits it was Fisichella leading Villeneuve and Schumacher. Heading into the first corner Villeneuve challenged for the lead going down the inside of Fisichella. The Williams driver overshot the first corner going wide into the gravel trap dropping behind Hill and Magnussen. A valiant Esteban Tuero attempted to overtake Villeneuve in his Minardi, however Villeneuve shut the door, causing Tuero to collide with the rear of Villeneuve's car. Tuero lost his front wing as Villeneuve lost his rear wing. Villeneuve appeared to be heading in for retirement as he exited his car, however he was then directed to get back into his Williams and resume the race, despite being multiple laps down on the leaders. The following laps saw Olivier Panis in the Prost overtake Shinji Nakano for sixth, before putting pressure on Magnussen in the Stewart ahead of him. Whilst this occured Schumacher began to hunt down Fisichella down ahead of him. Nakano who was running well in seventh, was forced to concede his position at turn 6 when he ran wide allowing Wurz and Irvine through. However most significantly, Schumacher was given a stop and go penalty following his incident with Frentzen. Following a protest by Williams following Schumacher ruining Frentzen's race. Following his stop and go penalty, Schumacher dropped to third behind old rival Damon Hill's Jordan. Schumacher quickly caught Hill, gaining a slip stream behind the Jordan in turn 6 and moving past Hill. Schumacher carried too much speed going into the corner, being forced to cut across the corner. In response Hill angrily gesticulated at the Ferrari driver. On Olivier Panis's 39th lap, he suffered a gearbox failure causing his car to spin off the circuit and into retirement. It was disappointment for him and the Prost team, as he ran in fourth position. Three laps later, Damon Hill pulled into the pits with an electronics issue, causing his retirement from third place. Following the pit stop phase Barrichello was third ahead of Irvine, Wurz and Magnussen who had dropped two places. Schumacher running in second place, chasing down the Benetton of Fisichella set a fastest lap of the race on lap 43. The following lap Fisichella entered the pits for his one stop of the race. The pit-stop however was not fast enough to prevent Schumacher taking the lead of the race. 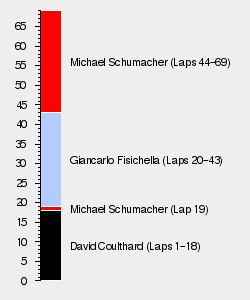 Schumacher then set the fastest lap of the race on lap 48 with a 1:19.379. Lap 49 saw Barrichello pit from third, dropping to fourth behind Irvine. Lap 50 saw Schumacher come into the pits for his second stop, luckily for him he just managed to maintain his lead over Fisichella in second. Tuero then retired on lap 53 with an electrical failure. As the race entered the final stages, Irvine came in for his third stop, managing to maintain third just ahead of the Benetton of Alexander Wurz behind him. Meanwhile further down, Jan Magnussen who was on course for his first points had come under pressure from Shinji Nakano's Minardi who was looking for Minardi's first points of the season. A scare for Magnussen occured on lap 63 when he slowed to allow Villeneuve through, losing speed Nakano attempted to overtake around the outside of the hairpin. Luckily for Magnussen he maintained the position ahead of Nakano. Schumacher was left to take his second win of the season, 16 seconds ahead of Giancarlo Fisichella in second position. Behind him the second Ferrari of Irvine, with Wurz right behind him. The two Stewart's finished fifth and sixth, Barrichello leading Magnussen. Magnussen successfully holding off Nakano's Minardi to take his first points in his career. The 1998 Canadian Grand Prix was significant in it being the first time a driver had been penalised mid-race for an illegitimate on-track manoeveure. Michael Schumacher received a 10 second stop and go penalty following his exit from the pits on lap 20 which forced fellow German Heinz-Harald Frentzen off the circuit and out of the race. Schumacher accepted responsibility for the accident stating in the post-race press conference "I haven't seen it on video yet and I can only imagine what happened. If what you say is what happened, then I really will have to make my excuses to him. I looked to my right when I came out of pit-lane, to see if there was anyone on-track and I didn't see anyone. So I pulled over to get the line. In the mirrors it is nearly impossible to see things, and I don't really know what happened, I will have to look at the video. But if I have done anything I want to excuse myself." Schumacher, had once again, come into controversy for his aggressive driving style that not for the first time had resulted in the ruin of another driver's race. His 1997 championship rival Jacques Villeneuve said "Michael goes out there believing nothing can happen and he can no wrong until someone really makes him pay for a wrong, then he'll keep on doing it". FIA President Max Mosley stated that "I feel there may be firmer rules to come on driver discipline", indicating that Canada was only the start on the FIA clampdown on dangerous driving. However despite the fact Schumacher had come under critcism for his own driving, Schumacher himself was not reserved in dealing out his own criticism against other drivers, this time directed at former championship rival Damon Hill. Schumacher was angered by Hill's driving style whilst trying to overtake him for fourth place stating "You wouldn't want to hear the words that I was thinking at that moment, because that was purely dangerous driving. If someone wants to kill you, they should do it in a different way. We are doing 320 km/hr down there, and for someone to move off the line three times is simply unacceptable. You can do it once, moving from one side to the other, that is OK, that is what we usually do. But to do it three times is impossible, you cannot leave a situation where you come so close to touching one another. I was so angry with the situation I wonder why he didn't get a penalty for what he did." Hill simply responded by saying "if there are any complaints about driving standards coming from him, I think its a bit rich". Only points finish for Jan Magnussen, in what would turn out to be his final Grand Prix. He was subsequently released from the team and replaced with test driver Jos Verstappen for the remainder of the season.